Pictured: Maggie Lea. Photo provided by Maggie. 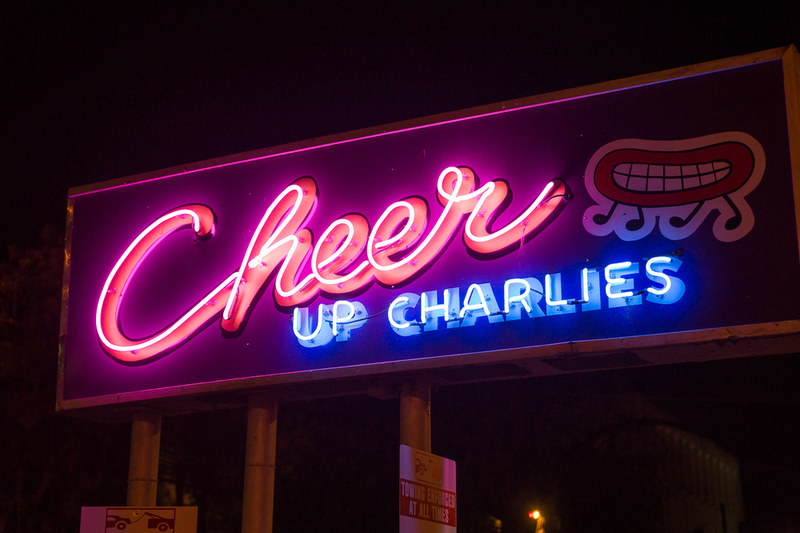 special note from the #bossbabesATX team: We're extremely excited to have our meet this month at Cheer Up Charlies, and we love the mission behind this venue and the community it supports. For that reason, we ask that you please do all that you can to support this location on Red River St. It's vital to members of our #bossbabesATX family that this venue lives on as a safe and fun AF space in Austin, Texas. COMMUNITY (n.): a social group of any size whose members reside in a specific locality, share government, and often have a common cultural and historical heritage. Establishing a community can be difficult—it's hard to accommodate everyone, sometimes the people who want to join can't access the group for a number of reasons (space, time, finances, etc.). Mobilizing a group of people to come together isn't easy. That's why we're floored by Cheer Up Charlies. We're floored by Tamara and Maggie (the venue's owners) who have managed to create a downtown venue that feels safe (and, honestly, like home... and who can deny the appeal of their killer cocktail menu?) for self-identifying women, members of the LGBTQ community, their allies and others who may feel marginalized in Austin spaces. It takes special people (~special women~) to even take on such a task—and then to do it WELL? DAMN. Q: What inspired you to start pursuing your career? Did you have any role models or learn from someone, in particular? A: I'm inspired all the time by all the films I watched when I was a kid. My mom was/is actually (probably) a hoarder, and from when I was four to when I was about 15, she had somehow acquired 800 to 1,000-something VHS's—back when VHS was the main medium. Needless to say, I watched all 900-something of those movies, and I had a lot of them memorized from front to back, beginning to end. I lived in my own world, in a dream world, but that feeling still inspires me today, at the core. I have a ton of people I look up to, but I don't have any one particular role model. It's the ordinary, day-to-day tasks that people complete that I am in awe of—not the celebrities, or the big-name, more typical, role models, or the mainstream groups. I created Cinema East after traveling alone one year to the snowy mountains of Park Slope for Sundance Film Festival. As much as I love the medium of writing or performing music, I think the ability to translate our lives into moving pictures has always inspired me. But ultimately, at heart, my passion is storytelling. I want to tell stories, I want to listen to others tell stories. And everything in my career, from booking live bands at music venues, to being a part of musicians' performances, to putting on literary events, to showcasing films, to the Q&As with filmmakers, all has to do with exhibitionism, and my love for the purest elements of telling a story. As far as Cheer Up Charlies, I joined in with Tamara who started the whole business because I was inspired by her vision of creating a place where queers, punks, straight allies and women all felt at home to express themselves freely. I do what I do because I love doing it, not necessarily because I want to impress anyone else. A: I would just say, if you are ever just sitting around and you have an idea and you think, "Pfft, that is the stupidest idea ever!" or "Nah, this will never happen," then that is a sign that you should definitely risk everything to try it. And I'm like that. I mean I'm talking about, risk all your money, sell your car, don't have kids, quit your job, lose all your friends. Maybe that's controversial to others, but that's how I feel. A: As much as I have done in the past five years, I feel that I haven't had a truly pure, solid, creative burst of energy since I came back from France in 2006. I felt invigorated to meet so many artists and musicians abroad and to hear their perspectives on U.S. foreign policy. It really gave me a fresh take on my life. On the year-long trip, I was also working with people at the EU and UN. I lived in Germany, France, Switzerland. Before my trip, I had suffered what I now see as a very not-unusual bout of clinical depression, brought on possibly by living in the 'burbs, but also having a lot to do with the fact that my sister was mentally ill, and my parents were foreign and didn't understand her mental illness. I was "Ms. Serious" 100 percent of the time, until I lived in Europe and realized, "You know what? You can't be creative if you aren't having FUN. And you can't make an impact or manifest changes in your life unless you are having fun." And that's when I had my biggest creative bursts of energy: when I decided to start having some fun. In the year after I came back, I started some popular literary book clubs, started Cinema East outdoor film festival, started meeting new people in Austin and creating a community that I felt at home at, and started throwing parties at Cheer Ups! I haven't stopped having fun since. Even amid the dark times, I try to pour that energy into a fun-loving, creative outlet. I look forward to my next big creative idea, though. I think it's on the horizon. I can feel it lately. Living abroad also brought me to my biggest realization so far—that, while I was there studying international relations and conflict resolution/mediation, the truth is, you can only start changing the world one unit at a time. Change your family or the way you relate to them first, then enact change within your small group of friends, then enact change within your city or your town or your community, and THEN maybe one day, take on the world! That is how I see it; I know a lot of world politicians probably wouldn't agree, but that's what I personally took from it all. Focus your love on those around you, and it will be a ripple effect. A: Definitely moving to Red River St. from East Austin. My heart was just completely broken when we moved, especially when I had poured so much time, energy, blood, sweat, tears, love into the Cheer Ups on the Eastside. It was an abrupt notice, a very cold and swift move by our landlord. And I was worried. On Red River St., there is often no foot traffic down here, and as much as people are saying Red River is important to Austin, it's still fading, more rapidly than other areas of town at least. You can't even look up at the downtown sky these days without seeing six construction cranes at a time. Also, moving a business like that really forces you to dig your heels into the ground, find out who you are. It's a lot of holding your own, and creating your own identity, and floating the ship. Re-integrating your community, trying to alter people's habits, trying to get people who you felt were loyal and part of your community to try a new area of town that they usually don't go to, or walk down to a party you're throwing one night. It's all been very difficult and trying. You sometimes just want to give up. Q: Do you have any tips for women who work in your industry? A: Well, no. I don't, ha! Tamara and I are the only women who are own venues in Austin, TX, at the scale that we are doing it. We just learn day-by-day, and sometimes we make the same mistakes over and over until we just stop making them! If anyone has any advice for us on this topic, especially if it comes from another woman, I'd be glad to take it. I guess if I had to think of something, maybe just this: Be nice to other women. There aren't many of us doing what we do. Don't copy others' ideas (it's really not that flattering! ), create your own domain, thrive within your own ideas and thoughts, stay fresh, reach out and connect. A: I think I hide out, or find one other person to hide out with. I have a particular spot I go to by the water in East Austin, actually. I go there, I read, I find inspiration from watching movies, and I sift through memories of my sister, who recently passed away. This is hokey possibly, but my dad always told me to "think about where you come from," but more emphatically he says, "think about WHO you come from," and this is what he means: He tells me to think about my people, the generations before mine, and the long and heavy history of ancient Chinese culture, politics, etc. He always tells me that our forefathers and mothers were people who could "endure," who could "bear it," who found the strength within themselves. I know that can sound like a stretch, but listening to your inner warrior is really important. Even if you have to use your imagination to fill in some of the factual and cultural gaps. Your favorite book: I don't have favorite books (I was an English Lit major; I just try to read as much as I can). I am currently reading: "No Longer Human" by Osamu Dazai, "The Feather Room" by Anis Mojani, "Cathedral" by Raymond Carver. Your Austin gem: I love Olive Vintage; I love how they curate their merchandise and artwork. I can always find the perfect gift for a friend there, and most of the time, a perfect gift for myself. Your social media handles: @mgglea on Instagram and Maggie Lea on Facebook, Cinema East on FB and Instagram, Cheer Up Charlies on FB and Instagram.